We get through a lot of hummus in our house, whether it’s the supermarket variety or the incredibly garlicky and insanely zingy homemade kind. The children love it. When they need a little snack in between meals, it tends to be a pot of hummus I reach for, plus a handful of chopped vegetables or breadsticks for dipping. The other week I borrowed a recipe book from the local library called Make It Moroccan by Hassan M’Souli, and came across a tasty looking salad smothered in a hummus-based dressing. I’ve never thought of using hummus as an ingredient in anything before, so thought I’d give it a go. M’Souli’s original featured falafel and haloumi cheese but I’ve used marinaded chicken breast in my version instead, and it works a treat. 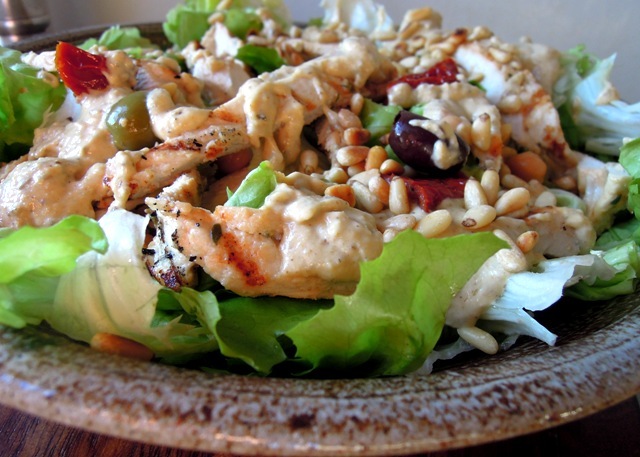 The chicken breast is butterflied and cooked quickly in a griddle pan, so it is beautifully moist and succulent, while the hummus, chickpeas and toasted pinenuts give the salad a lovely, satisfying nuttiness. Place the flattened chicken breasts in a dish and add the garlic puree, thyme, lemon juice and 2 tablespoons of olive oil. Rub the marinade ingredients into the meat and then leave for around 20 minutes. Whizz up the hummus, cumin and preserved lemon in a food processor with the remaining olive oil until well combined and runny. Add a little more oil if you like to get the right consistency. Throw the lettuce leaves into a large salad bowl with the olives, sundried tomatoes and chickpeas. Heat a griddle pan over a fairly high heat and fry the chicken pieces for two to three minutes on each side. Slice into strips and add to the salad. 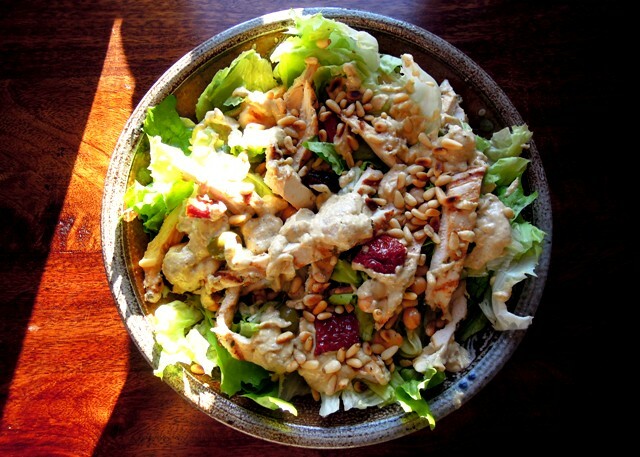 Drizzle over the hummus dressing and toss it all together. Finally, sprinkle over the toasted pine nuts and serve. And as this recipe features fresh thyme, I’m entering it into this month’s Herbs on Saturday blog challenge, devised by Lavender & Lovage and hosted by me, Bangers & Mash. The combination of flavours in this salad sounds fantastic! My first jar of home made preserved lemons is just about ready to use – I’ll definitely be trying your recipe. We’re a bit of a hummusy household too! I’m sure I must make a huge batch at least once a week, and like you have never thought of using it as a dressing. Will do now though, this looks yuuuuuum :)))) Gorgeous photos too btw. I’m a bit of a hummus addict, to the degree that my husband had to ask me to stop eating it for a while. But even given that, I’d never thought about using it as an ingredient either! I love the look of this salad, I really am going to have to give it a go. Bookmarked. Middle Eastern food is my absolute favourite – such big flavours. Like you, I always find myself reaching for the hummus as it really is so handy to have around as a snack. Lovely piccies! Thanks Heather. I seem to be going through a big Ottolenghi phase at the moment too, so expect more posts like these coming soon!